As you might know already, I visited Czech Republic on my last trip of 2018. Last month I showed you around Český Krumlov and today I'm going to take you to Český Šternberk with me. You can get to Český Šternberk from Prague in about 45 minutes by car. It's a small village on the river Sazava. 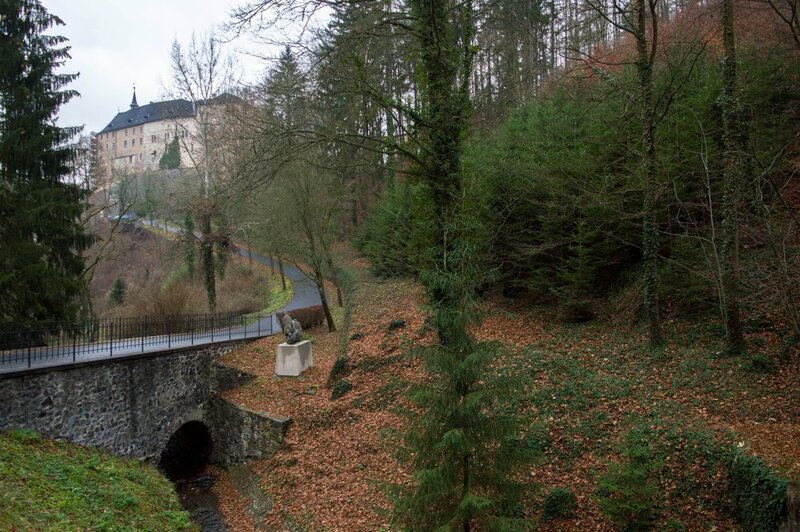 The village itself is not that interesting and we came here to visit a castle overlooking Český Šternberk. After you park your car you will have to walk up the hill for about 5 - 10 minutes. 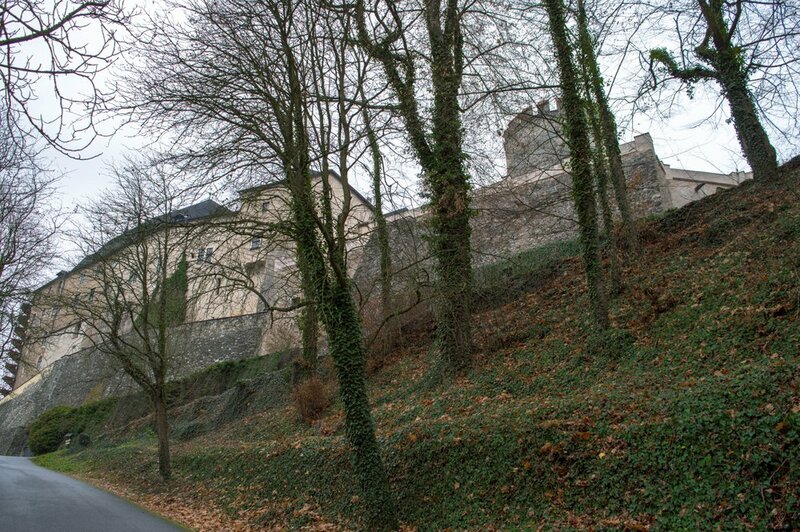 The castle is open to public but in the winter months you may need to call them in advance to arrange the excursion. You can't visit the castle without a tour guide. Are you wondering why? 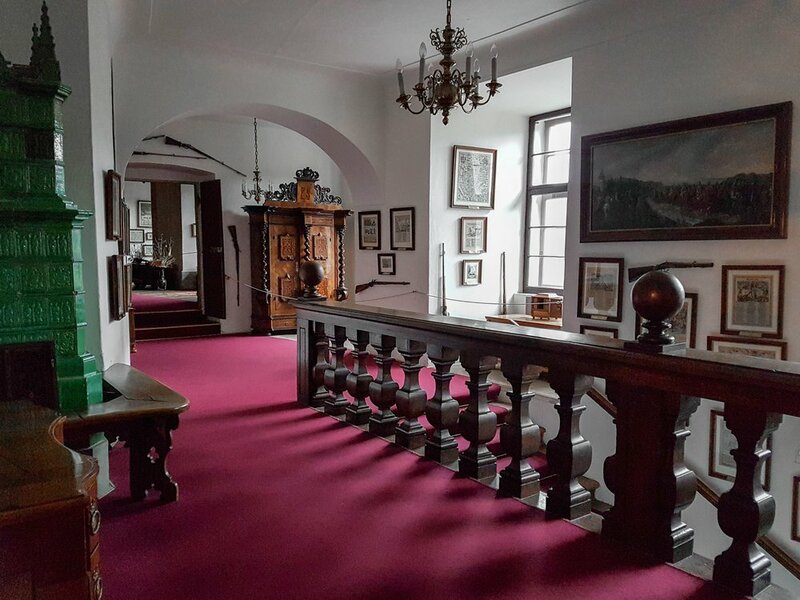 Český Šternberk castle is a private property and the owner with his wife live on one floor of the castle. Tourists are not allowed to wander around the castle without the tour guide to protect their privacy. That part of the castle is obviously not accessible. When you get to the top of the hill, follow the signs to the ticket office. There you will pay for your purchased tickets. A tour in English is 180 CZK per person (about 6.70 USD). You might wait for a few minutes to get all people together before the start of your tour. The castle was built by the Zdeslav of Divišov in the 13th century. At that time there were many German settlers in the region, and he took the name Sternberg from the German word for star (stern) and hill (berg). The eight-pointed star is still the Sternberg symbol today. The heraldic symbol was also accompanied by a family motto. "The star that never falls down". 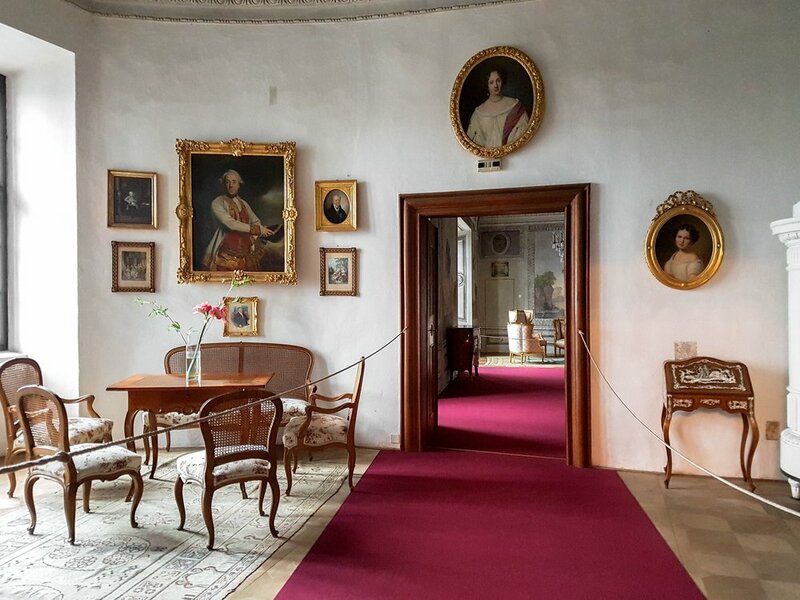 The Sternberg family became one of the oldest aristocratic families in Czech Republic. They have been in the possession of the castle from its very beginning. The castle was reconstructed in the 15th and 16th century. Jiří Sternberg and his mother Carolina also restored the castle at great expense at the beginning of the 20th Century. 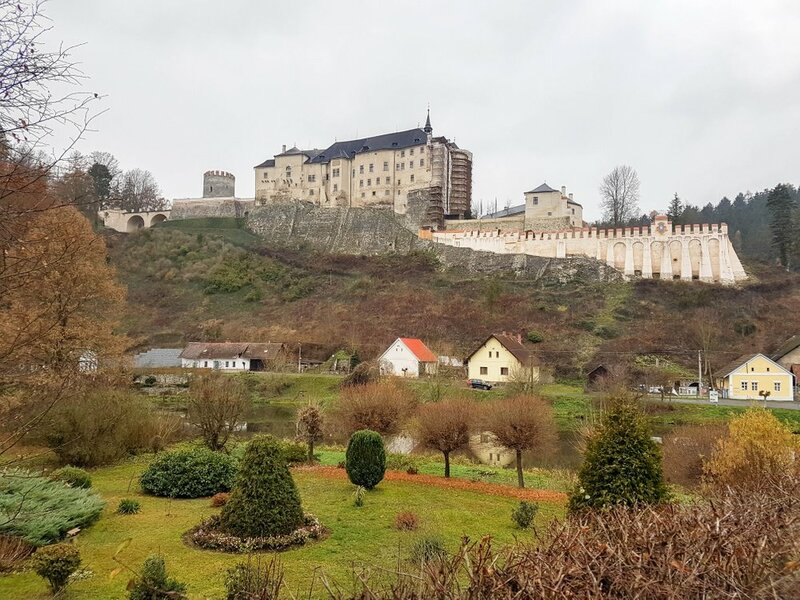 When the castle was taken over by the Communists in 1949, Jiří Sternberg became a castellan and a tour guide and he was allowed to still live in the castle with his family. The owner of the castle was suddenly occupying only two rooms with his whole family. But he didn't leave the castle. He stayed there and made sure that all artifacts remained untouched. 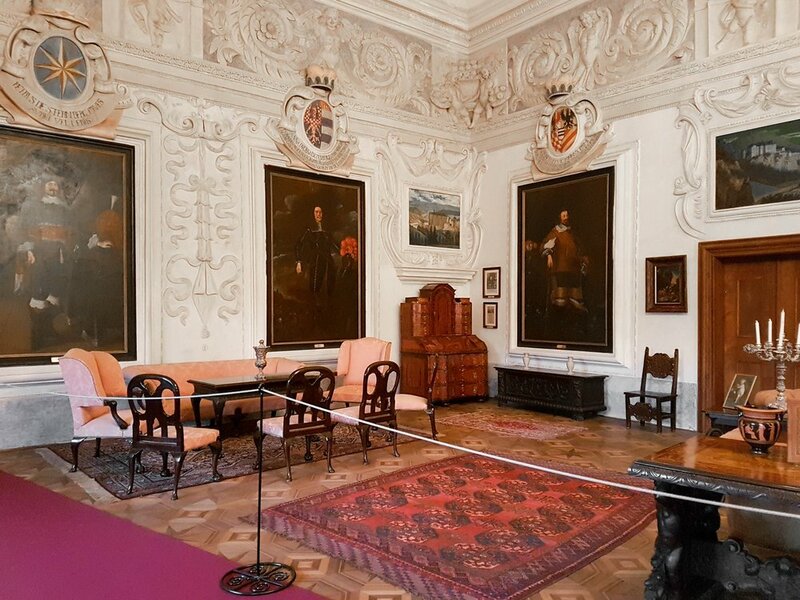 After the restitution, the castle was returned back to the family and his son Zdeněk returned from Vienna to take care of it. The current owner Zdeněk Sternberg is the second eldest son of the nine children. He is 96 years old and he is a descendant in the 20th generation of the founder. 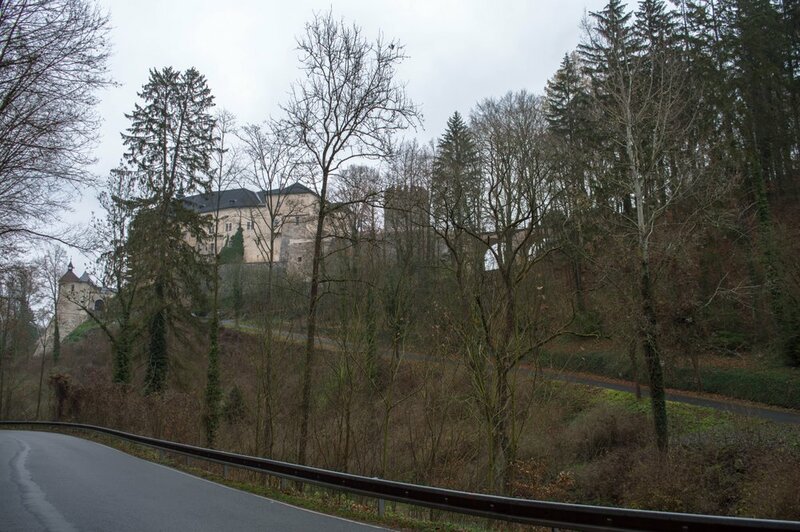 He and his wife have a separate entrance to the castle and live in the part of the castle that used to be for guests. 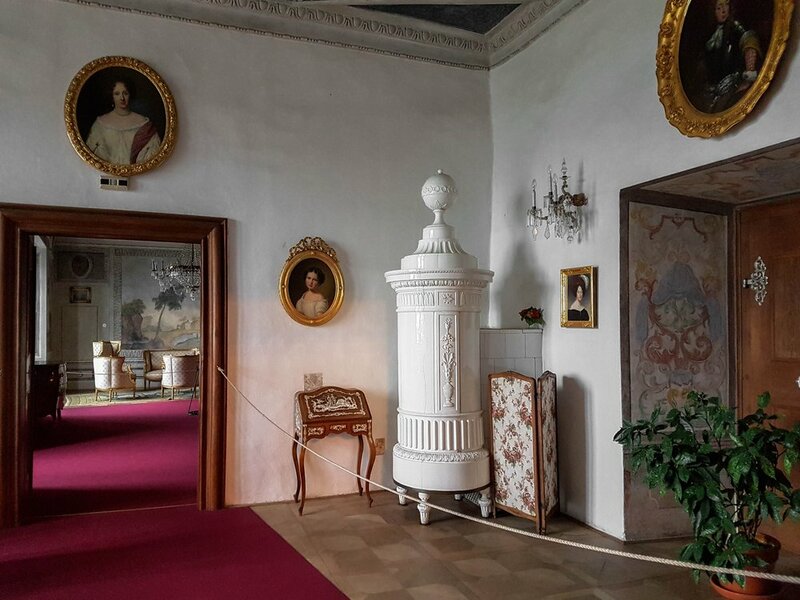 The floor of the castle where the family lived before serves now as a museum. This is the part of the castle that is private.. 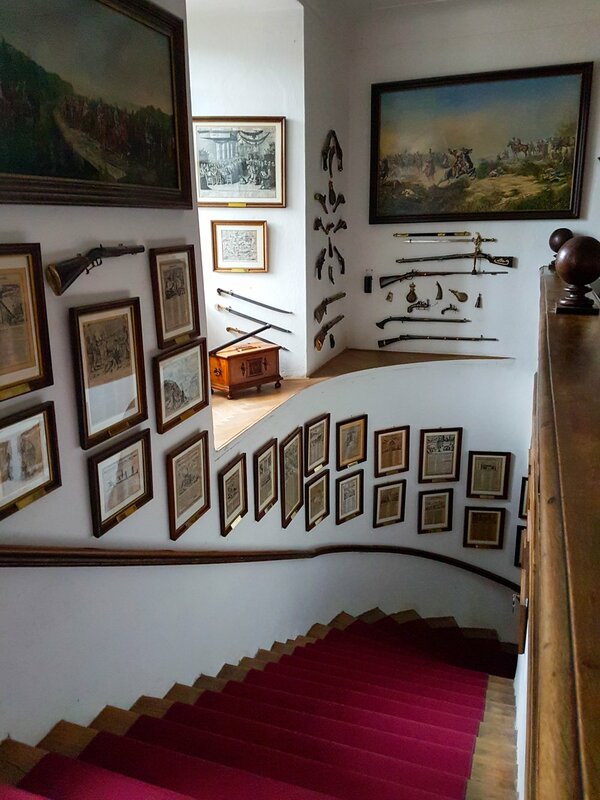 The tour starts one floor above the private part. There is no central heating in this part of the castle so it's very cold. I think it was even colder than outside. Our tour guide mentioned that it's quite cold in summer as well, so make sure to dress properly. 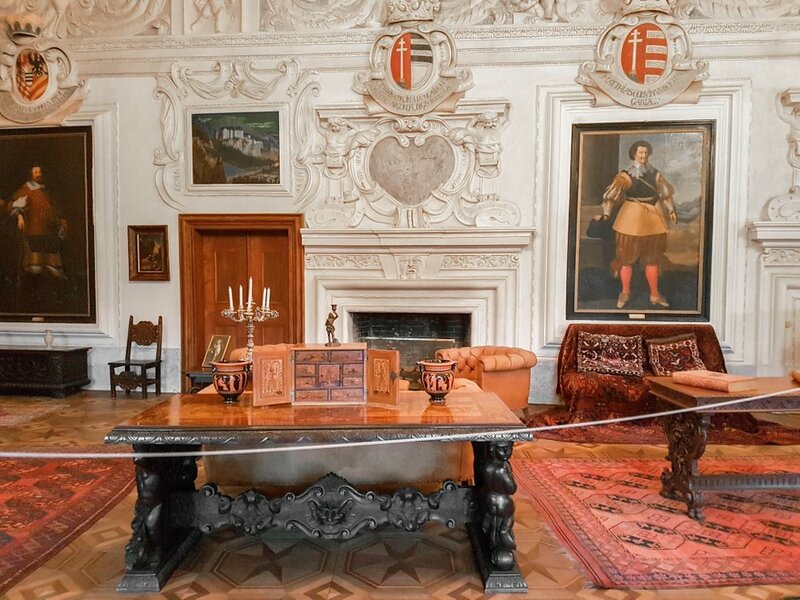 During our tour we will visit 15 rooms furnished in various historical periods. We will go through The Knight's Hall, The Dining Room, The Yellow Salon, The Ladies’ Lounge, The Chapel, The Library, and a few more. The Knight's Hall is the most impressive room in the castle. It dates back to the 15th century. 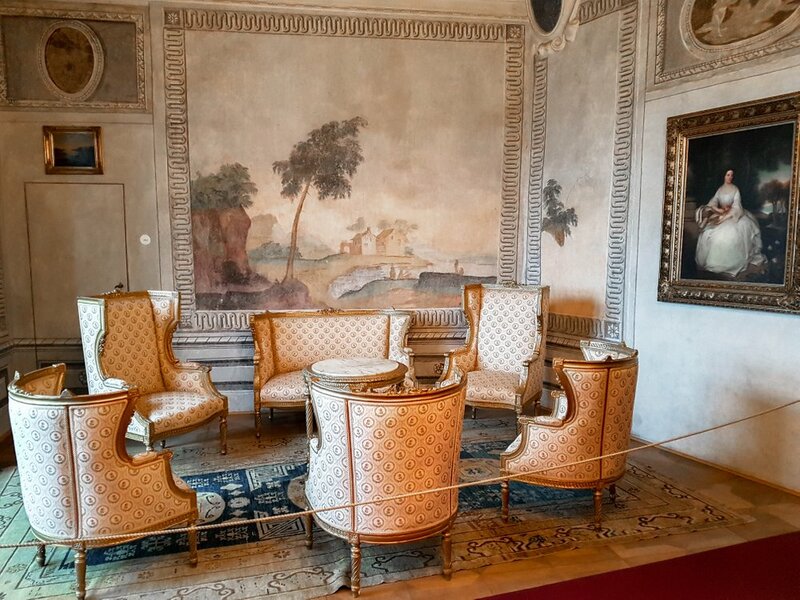 The high walls and ceiling of the room are decorated with beautiful stucco adornments. 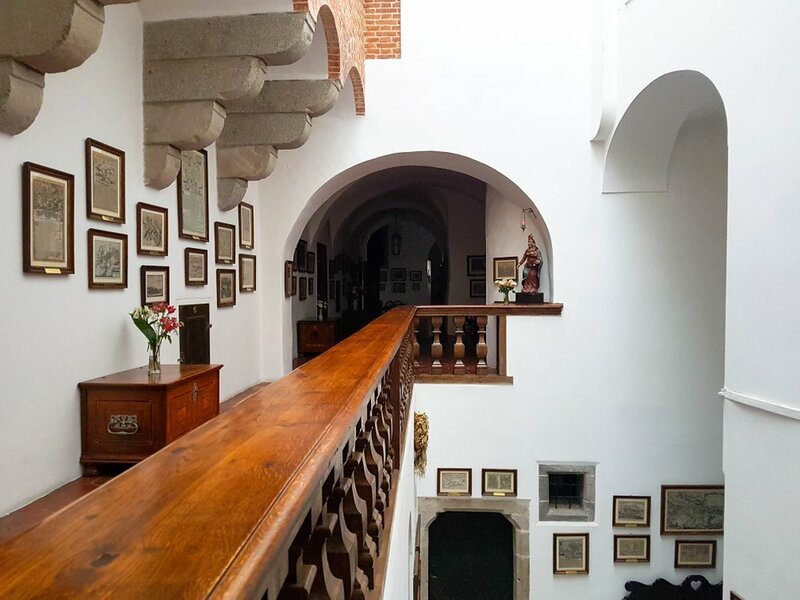 All room is decorated with coats of arms related to the family and there are portraits of the family members hanging on the walls.. 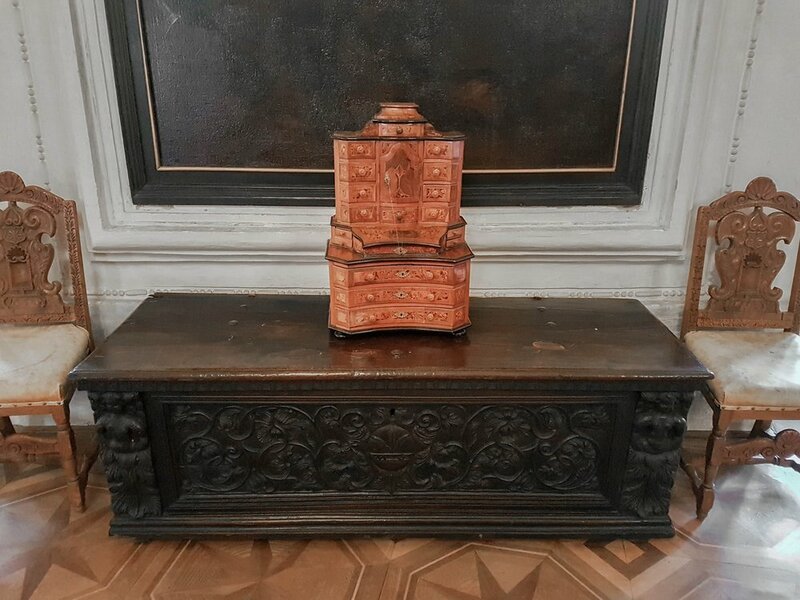 This wooden box is the oldest artifact in the castle..
From The Knight's Hall we enter a room with a portrait of Carolina of Sternberg - grandmother of Zdeněk Sternberg. On the other side of the room is a beautiful small lounge from the 17th century. The next room is The Ladies' Lounge. 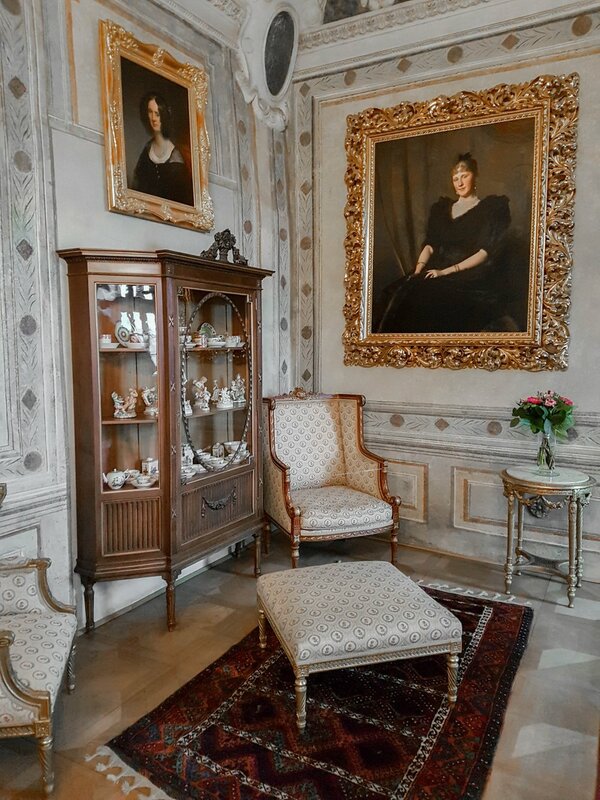 The room is furnished with the 18th century Rococo floral furniture. The chairs do not have armrests because the women sitting in them during that period wore big and wide dresses. I've seen so many chairs from this period but never realized that they don't have armrests. It is such a practical solution! Otherwise it would probably be very uncomfortable..
From the ladies' lounge we enter The Library. 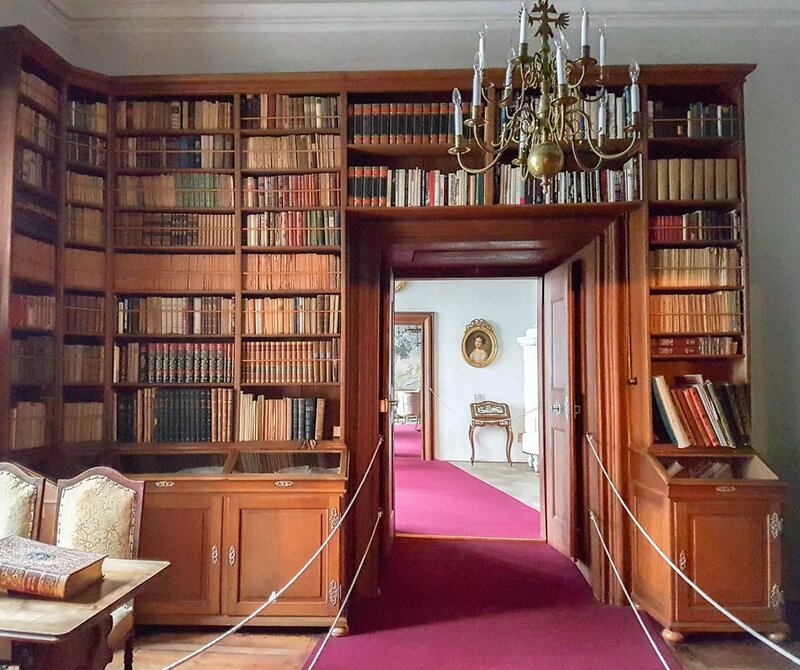 This room holds more than 2500 books. Most books are from the 19th century but there are some of them dating back to 17th and 18th century as well.. 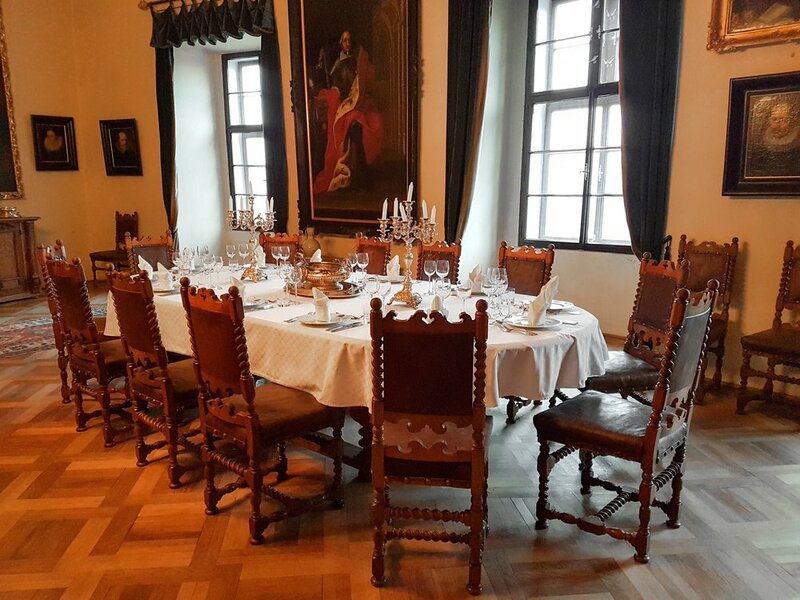 The Dining Room is the second largest room in the castle. This room is dominated by a large table with 12 chairs. In case there were more quests a few chairs could be added. The room is equipped with precious silverware.. 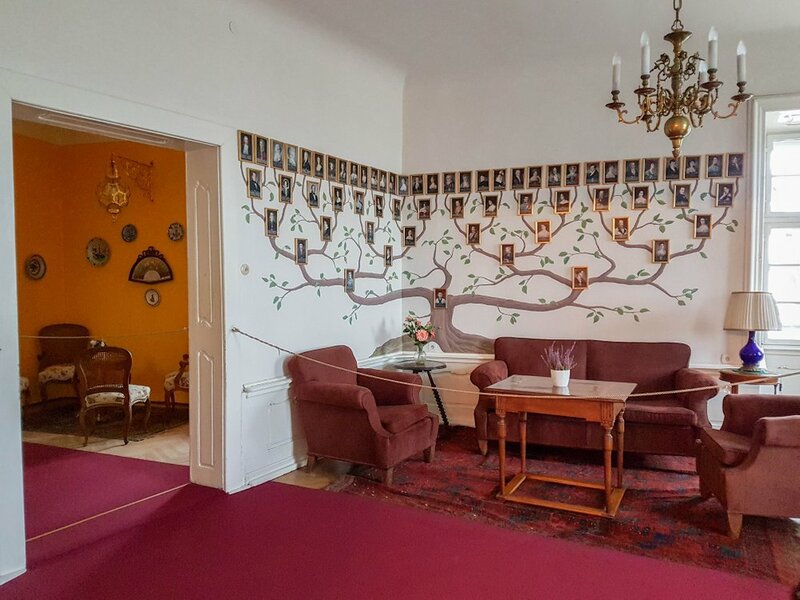 The last room that I will show you today is the one with the Sternberg family tree. Zdeněk Sternberg has only one son Filip who lives with his daughter in Vienna. They visit the castle a couple of times every year. PS: All photos are taken with my Samsung Galaxy S7 as my old camera broke during this trip.